I was in Trinidad teaching Linux/Unix security for TSTT, the Telecommunications Services of Trinidad & Tobago, the T&T telecom company. 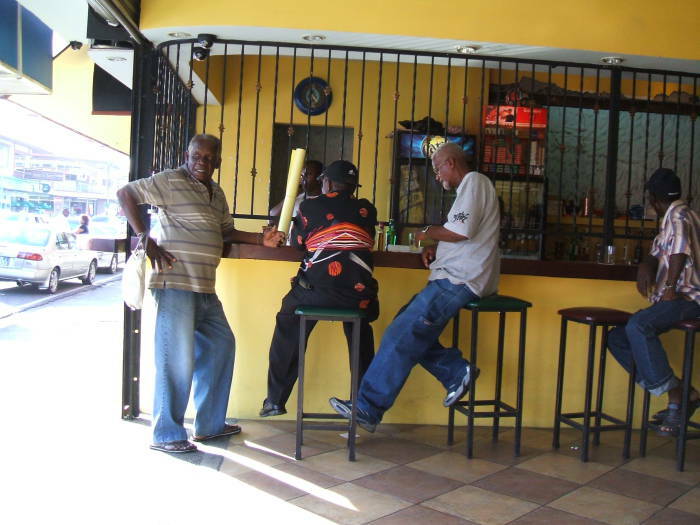 On Friday after class it was time for a casual lime with the TSTT staff. 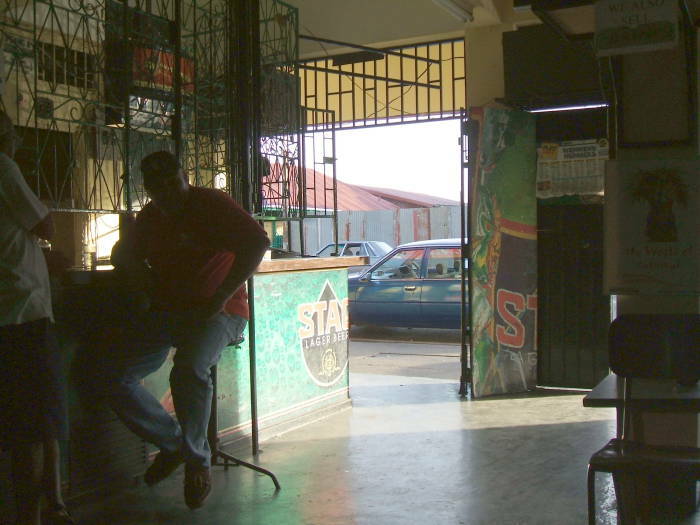 Then I had a little time on my own in Port of Spain. 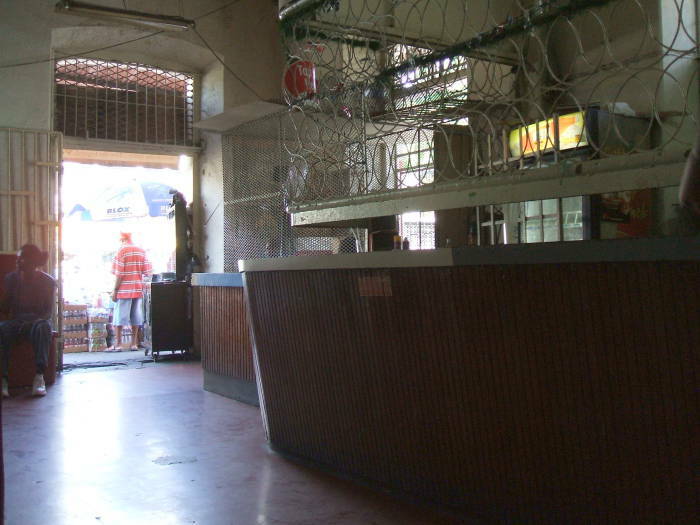 I had checked out of the Kapok Hotel to stay in a low-cost guesthouse. 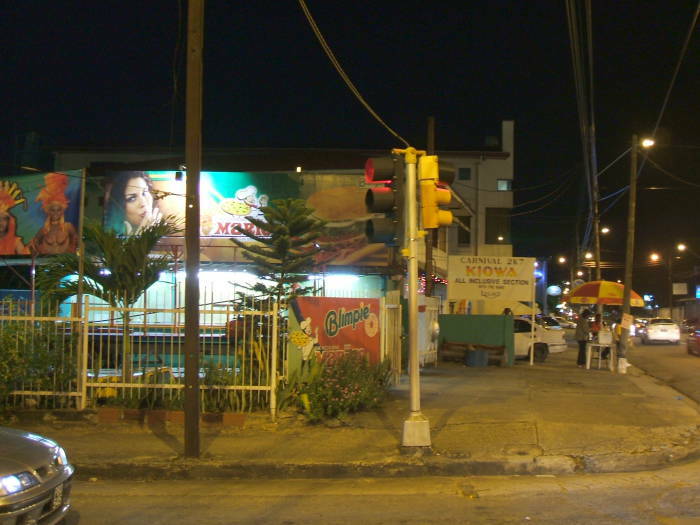 A little closer to the ground and a lot closer to the real Trinidad. 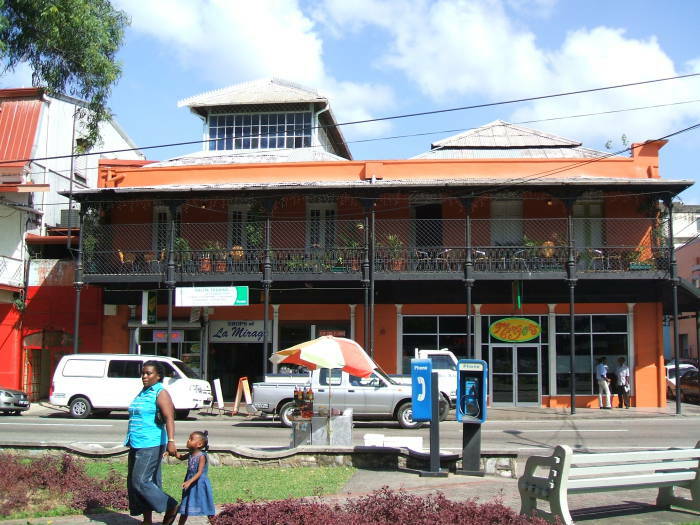 This is Pearl's Guesthouse, a great place to stay. Once the job was over I left the hotel and moved into Pearl's. 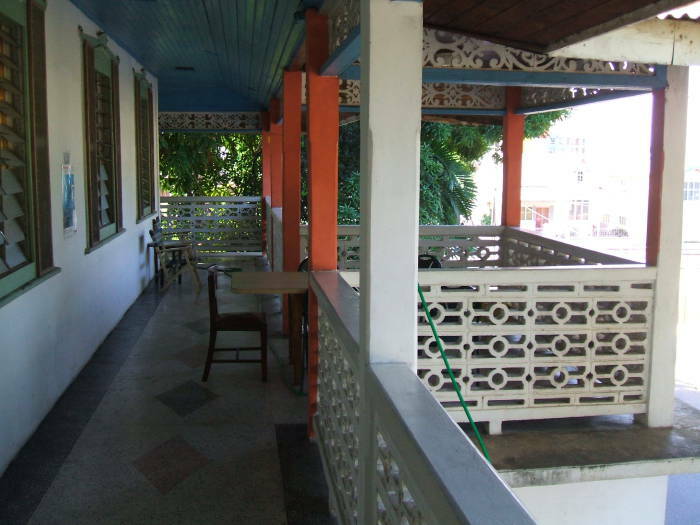 The balcony at Pearl's Guesthouse is a very pleasant place to relax and look out over Victoria Square, a park taking up a full block. 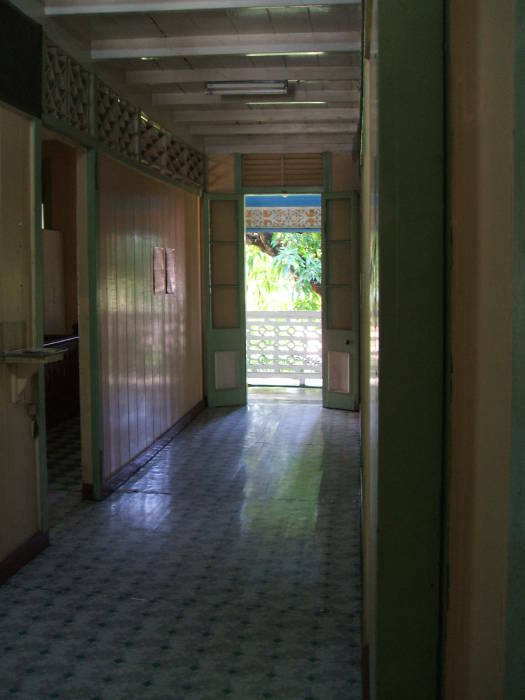 The hallway at Pearl's Guesthouse is cool in hot weather, with smooth linoleum underfoot. 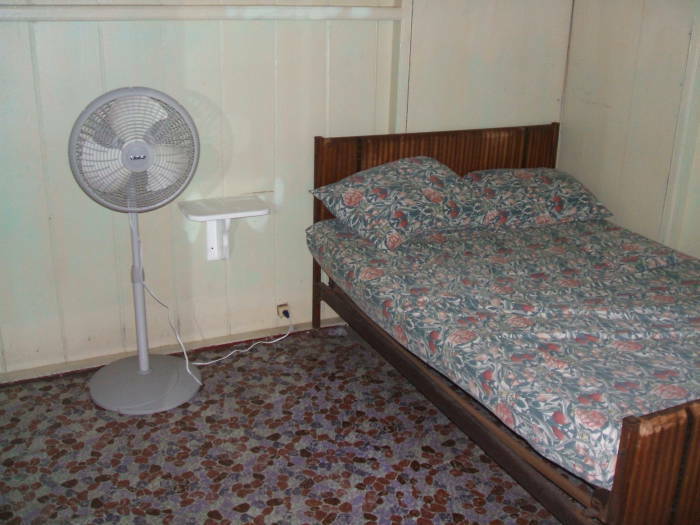 My room at Pearl's Guesthouse was simple, but it included the all-important fan and comfortable bed, plus a sink and a small cabinet. What more do you really need? It's the next morning and I'm getting the Bake and Shark breakfast at The Breakfast Shed. This includes a strip of fish (shark, I would assume), some coarse bread, and some salad. And a huge cup of orange juice. I would always get confused and call this "Shark and Bake" instead of "Bake and Shark". The Trinis all thought this was hilarious. It's a quiet morning at The Breakfast Shed. It's Saturday morning, it's only about 9 AM, and things are just getting started on Island Time. 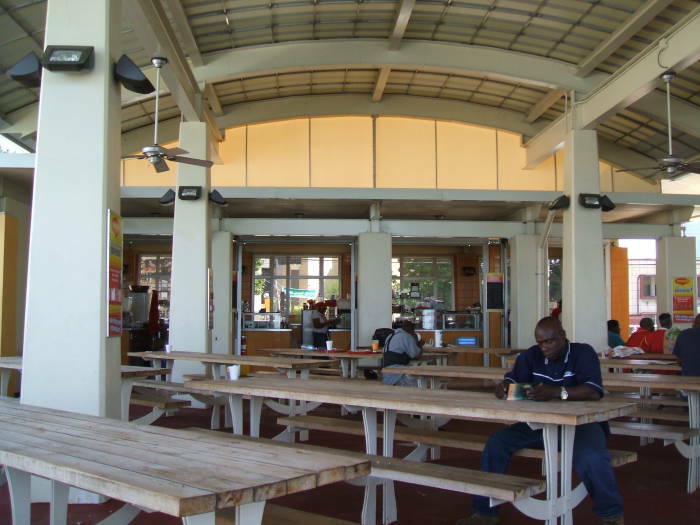 There are several food stands around The Breakfast Shed, you have a lot of choice. 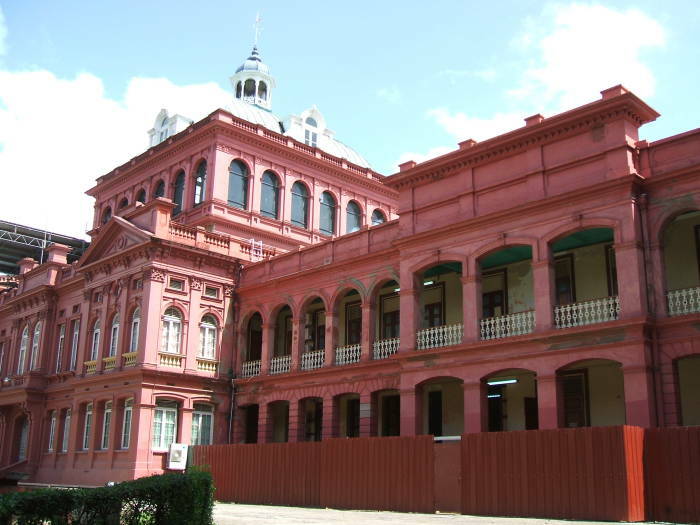 This is the Red House, the home of the Trinidadian Parliament. In front, beyond that tropical snarl of cable, is an eternal flame and monument to the government workers, policemen, and security forces killed in the 1990 coup. Yes, coup. On 27 July 1990 114 members of the Islamic fundamentalist group Jamaat al Muslimeen stormed Red House and took hostages including the Prime Minister. Meanwhile other group members seized the only television station and one of just two radio stations in the country. One of the group's two leaders, Yasin Abu Bakr, announced on the newly seized television station that they had overthrown the national government. He called for calm and said that there should be no looting. That of course led immediately to widespread looting plus arson. 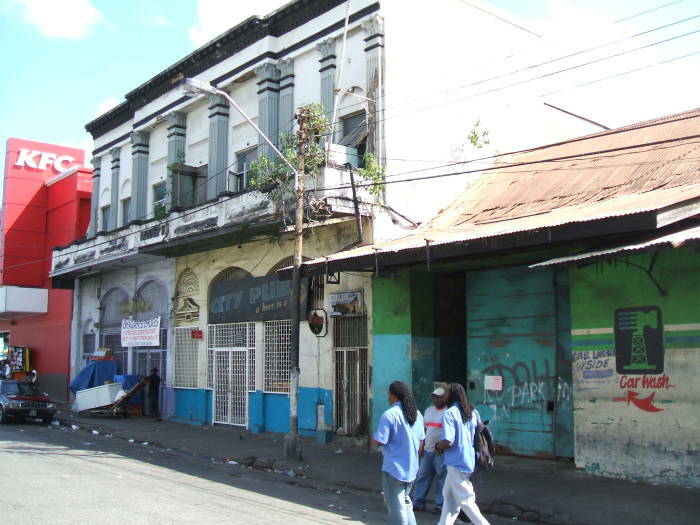 The national Defense Force and Police sealed off the area around Red House. The Acting President declared a state of emergency and imposed martial law. A six-day siege of Red House ensued. Twenty-four people were killed, there were millions in property losses, and the Jamaat al Muslimeen members were eventually tried for treason. However, the courts upheld the amnesty offered to end the seige. 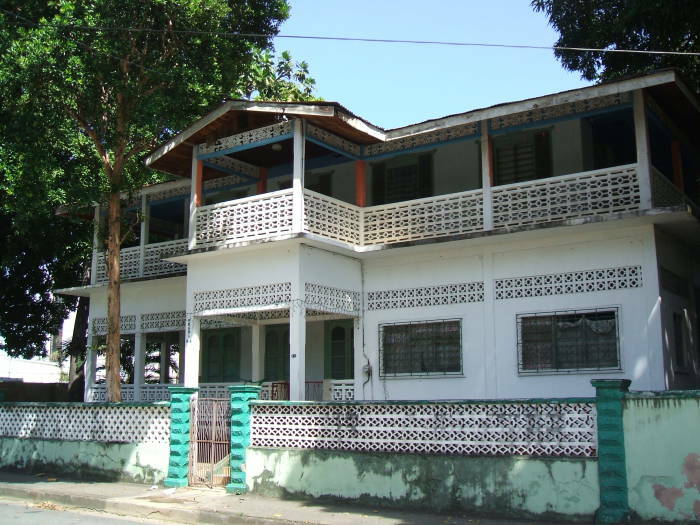 A court decision twenty years later ruled that Jamaat al Muslimeen properties should be sold to pay for the coup's destruction, but a year later it was still held up in the courts. 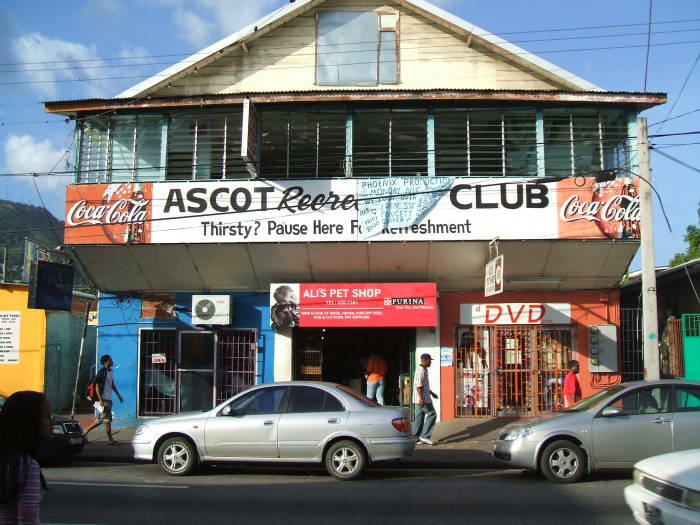 You can win bar bets by asking non-Trinidadians if there was ever an Islamic fundamentalist coup in the western hemisphere, and if so, where. I don't think that the history of this coup is related to the prohibition against wearing any clothing with a camouflage pattern, as that prohibition is common to many Caribbean countries. 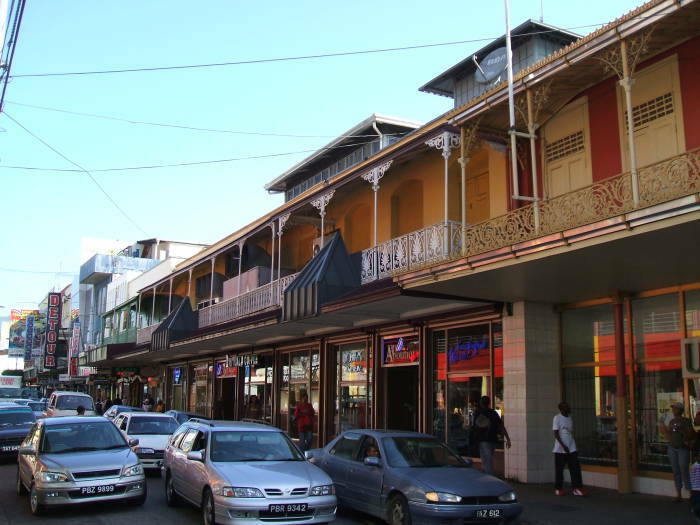 These street and market scenes show downtown Port of Spain, starting with some shops under balconies with iron railings. There had been a native fishing village along the shore, Cumucurapo or Place of the silk cotton trees. 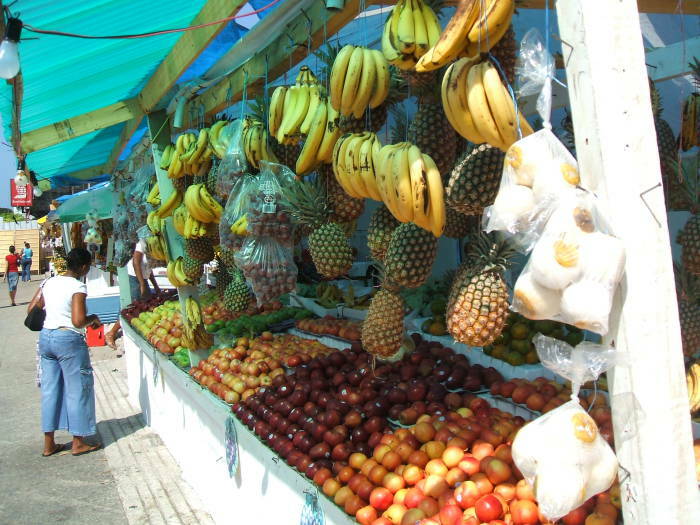 The early Spanish settlers established a port here, Puerto de los Hispanioles and later called Puerto de España. By 1560 there was a Spanish military garrison here. The French naval commander Comte D'Estrées stopped by in 1680 and reported that he found no "Port of Spain." Or at least nothing that impressed him as being worthy of that name. The Spanish had attempted to establish a capital about 11 kilometers inland, but it crumbled into disrepair. 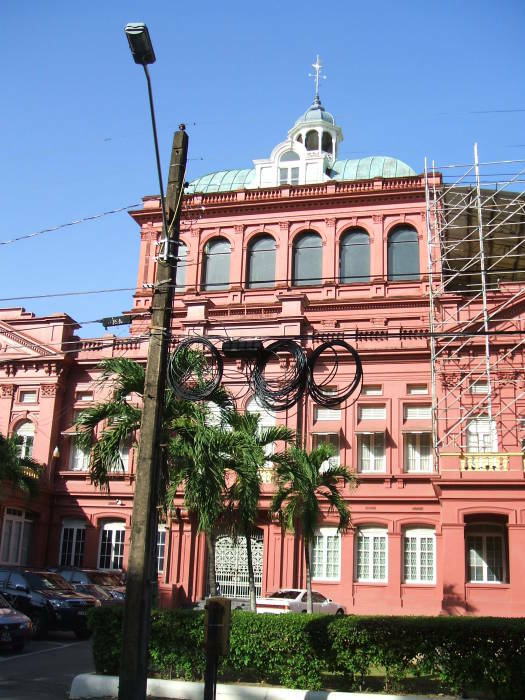 Governor Don Pedro de la Moneda transferred his seat of government to Port of Spain in 1757, making it the de facto capital (and later to become the official one). 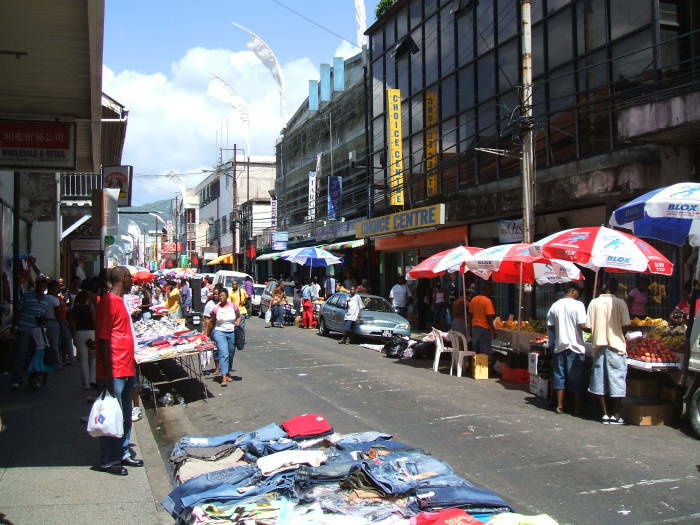 Now Port of Spain is an important financial services center for the Caribbean, with the headquarters of two of the largest banks in the region: Republic Bank, and the Royal Bank of Trinidad and Togago. 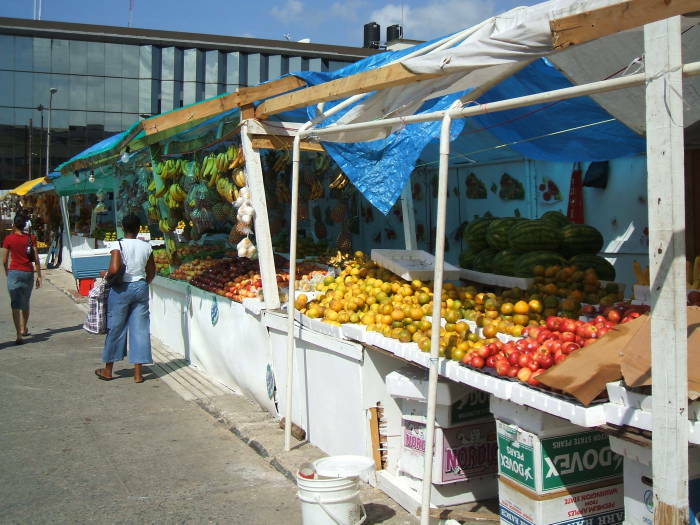 It also has the largest container port on the island, which is one of the major shipping hubs in the Caribbean. In addition to containers the port also handles roll-on/roll-off and both dry and liquid bulk cargo. 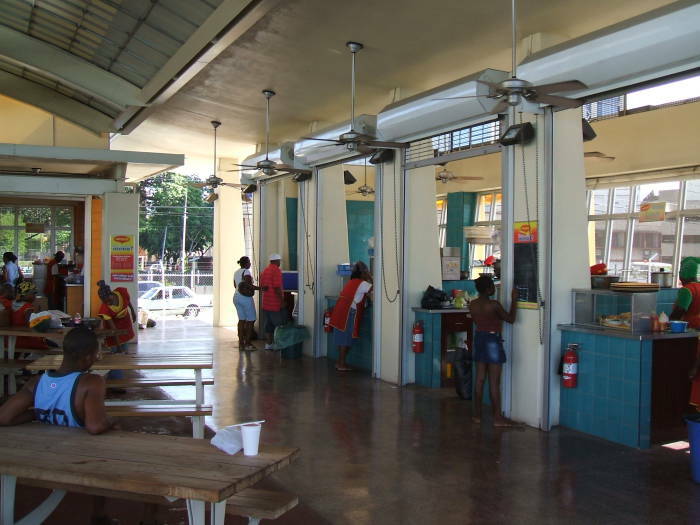 There is also a ferry service operating between here and Tobago. 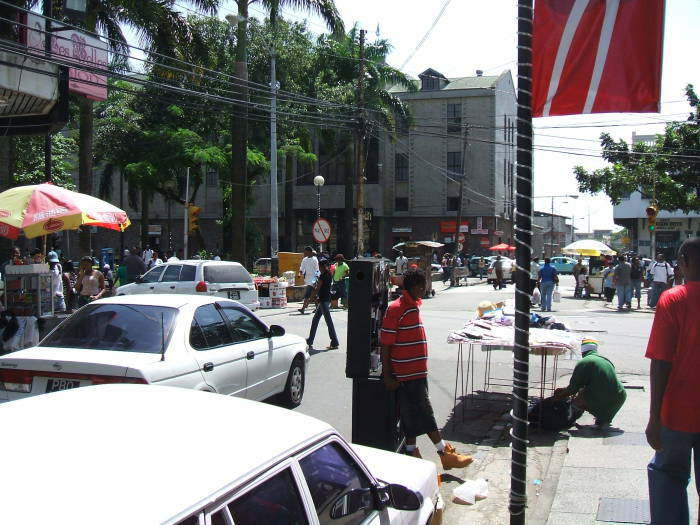 The downtown bustles with business, some of it large and formal like the headquarters of several oil and gas companies. 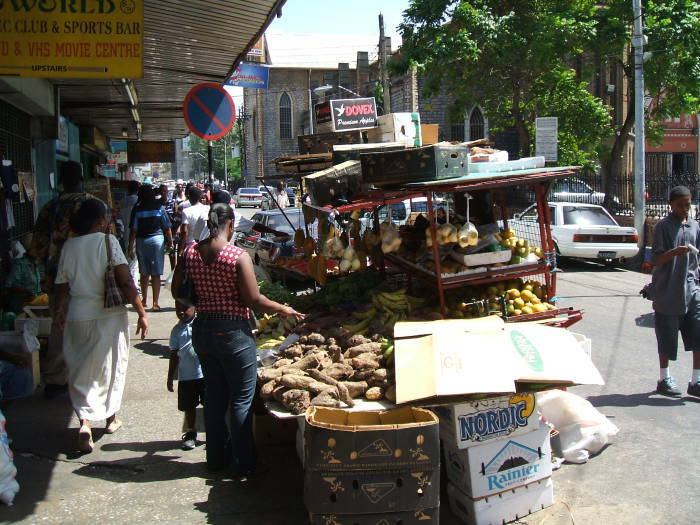 Some of the business is small and informal as we see here. 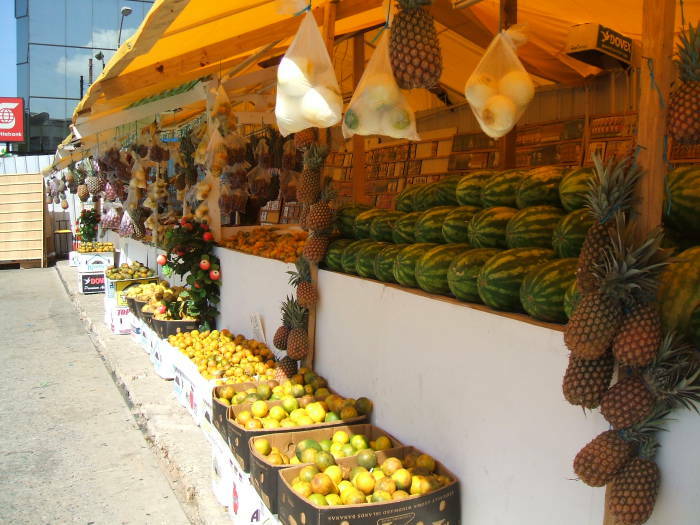 This downtown area is locally known as "Town", pronounced more like Tong here, and is the place to go for fresh produce, bootleg music, and a casual lime. The guy in the red-black-and-white shirt is selling music. There are vendors at least every block with these mobile music stands selling bootleg CDs, with their stereos powered by car batteries and demonstrating the music. The wide mix of ethnic backgrounds makes for a wide mix of musical styles. 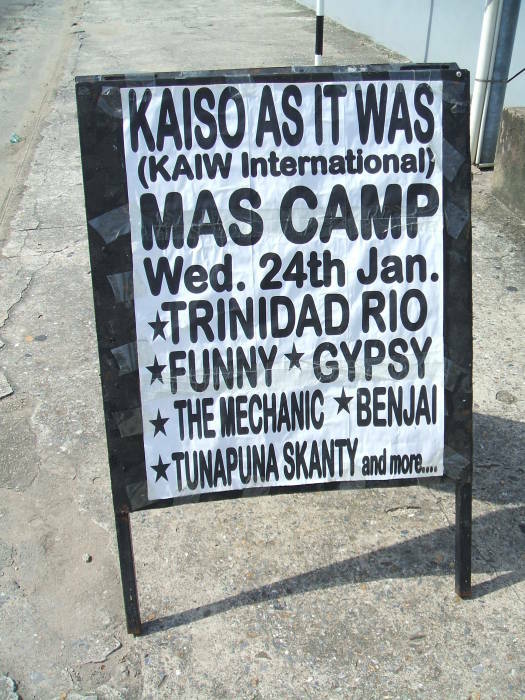 There is kaiso, which is the Old-Skool traditionalists' word for what pretenders like Harry Belafonte call "calypso". And soca, sort of modern dance-kaiso. And reggae. And lots of steel pan. Real pan is not one steel drum as a novelty addition to a band, it's an entire band made up of steel pan drums in a wide range of sizes. Larger pan bands include the engine room, manned by players with a sense of rhythm if not tune, beating out percussion on all sorts of scrap metal and car parts. 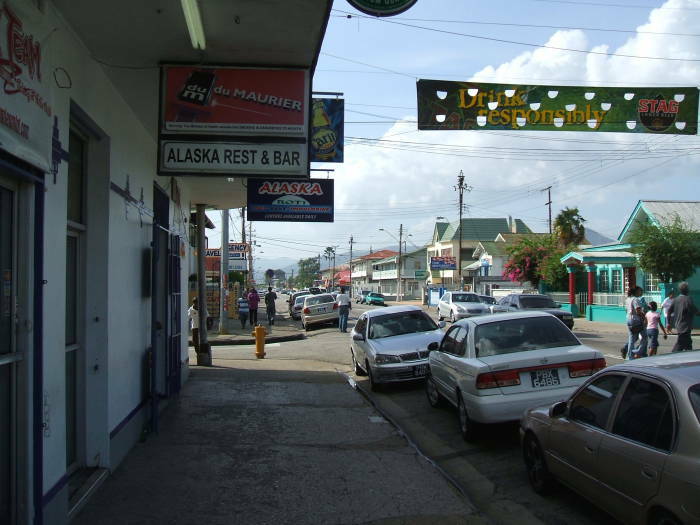 Many people in Trinidad and Tobago claim that the steel pan is the only acoustic musical instrument invented in the 20th century. This is a place where you can learn to play the pan! 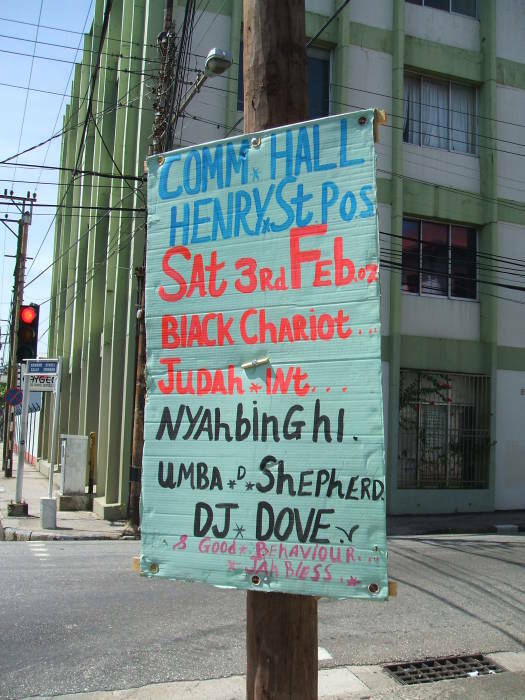 Below is some real kaiso and soca and pan music. 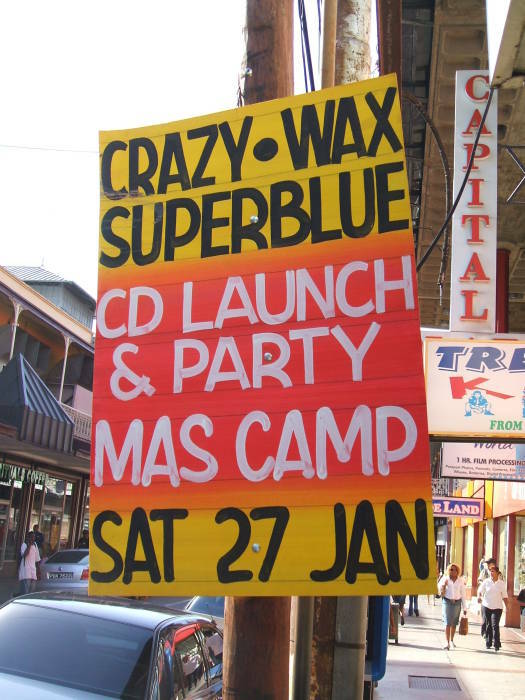 Notices about music line the street as Carnival time approaches. 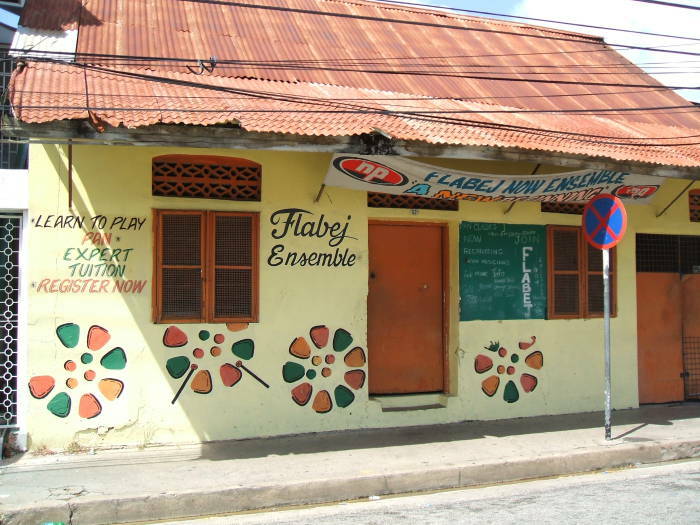 Mas camp is a place that a mas band prepares for Carnival. "Mas" is short for "masquerade". Music, costumes, and more must be prepared before Carnival arrives. Traditional Mas figures portrayed a set of traditional characters: the Midnight Robber, Police and Thief, Wild Indian, Bat', Jab Molassie, Jab Jab, Red Devil, Blue Devil, and Dame Lorraine. Here is the Kiowa mas camp headquarters. The engine room was pounding out the beat every night. 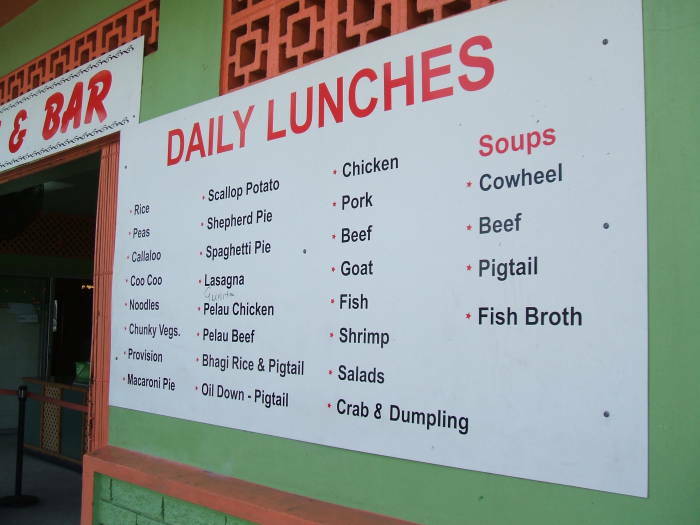 This menu is typical for Trinidad — tropical, creole, Indian, all mixed together. This is one of the more oddly named businesses: Alaska Restaurant & Bar. 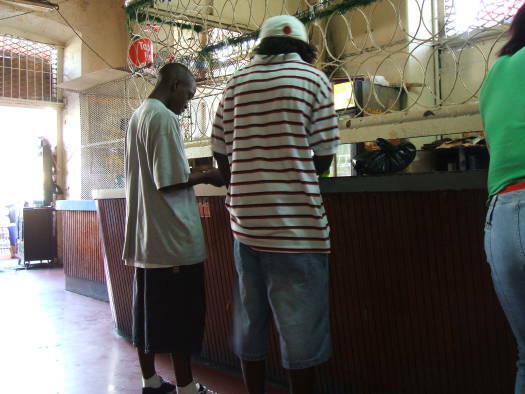 They sell roti, which is a sort of Indian-creole-tropical food. 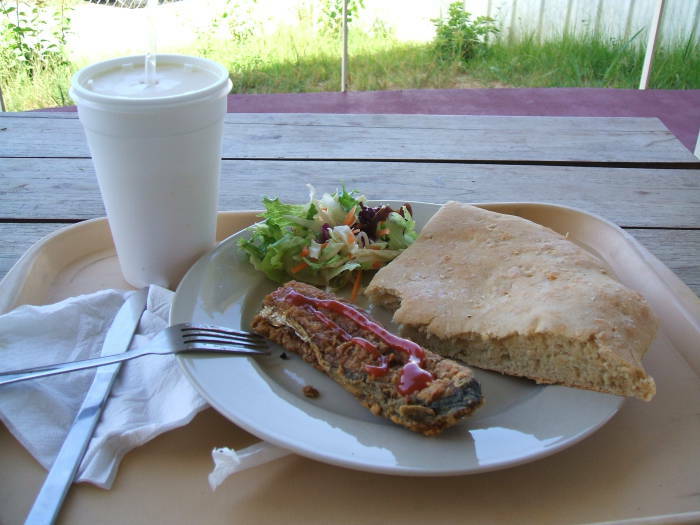 Roti is a dish that suggests that burritos had been invented in India and then perfected in Trinidad. The Alaska Restaurant and Bar rolls a mean roti. 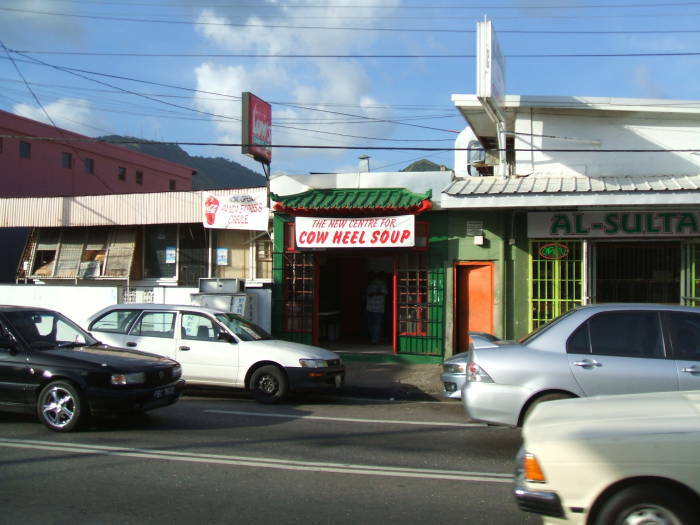 Cow heel soup is popular. And as this establishment proclaims, it is The New Centre for Cow Heel Soup. Notice that next door is the Al-Sultan, a bar with an Arabic name. 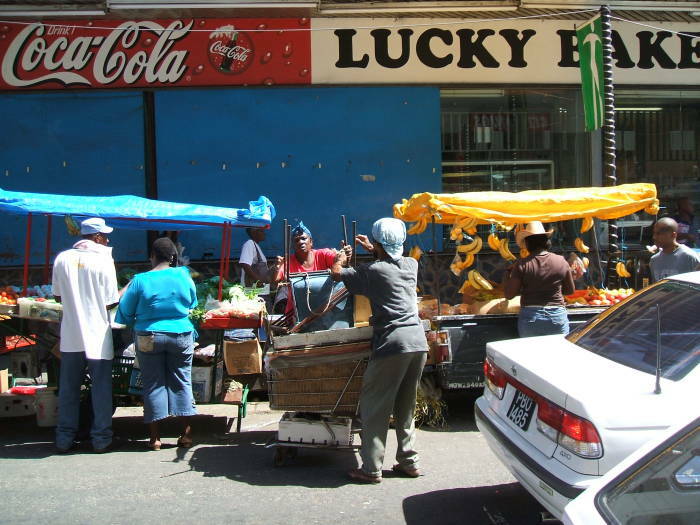 Welcome to the ethnic mélange of Trinidad. 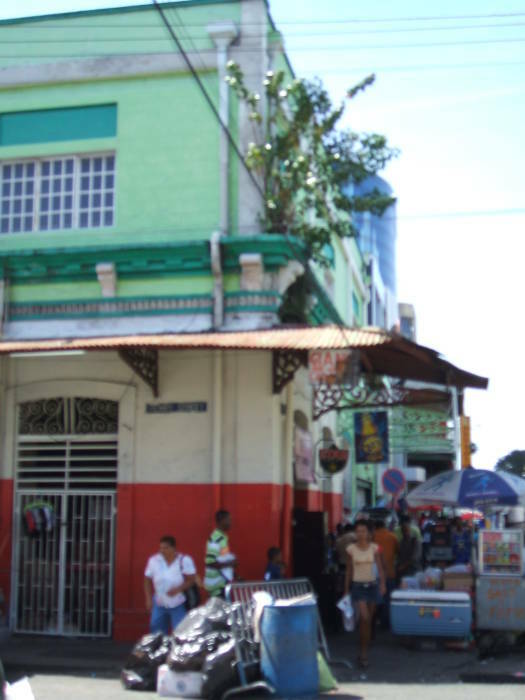 Pet supplies and a social club, one-stop shopping! Here I am hanging out at a pub downtown for a casual lime with the locals. "Lime" can be used as a noun or verb, to refer to a party, happy hour, relaxing with friends, the end of the day, whatever. 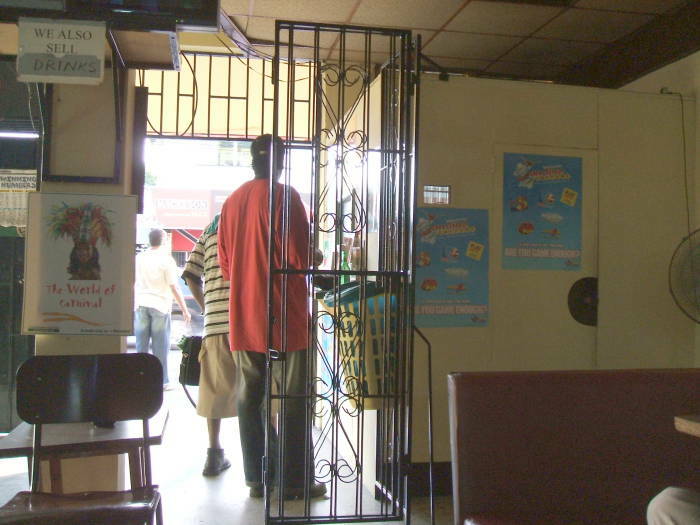 Many pubs enclose the bar in iron grillwork, and with the crossing grill like this one shown above, you have to tip your bottle at about a 45° angle to get it out from behind the bars. I think that things get a little rowdy at Carnival time. 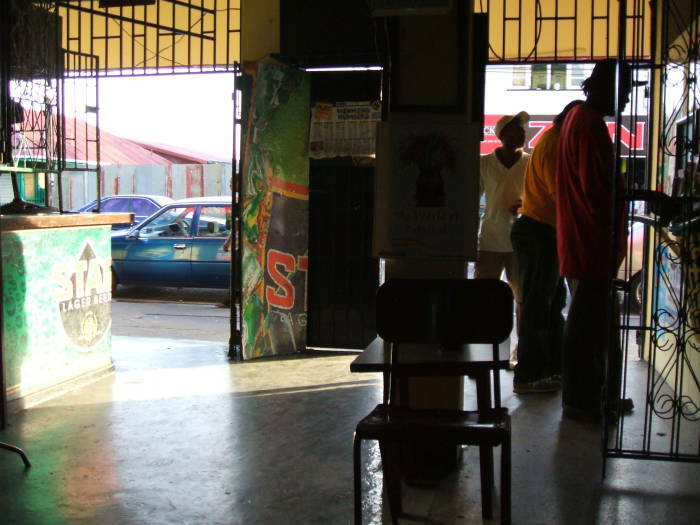 Now it's time for a casual lime with the regulars at the Universal Bar in western Port of Spain. It has vertical bars, so you can reach through and lift the bottle out in the vertical position. Wherever you have your lime, you want the drink to be beastly. That's the local term for "very cold." 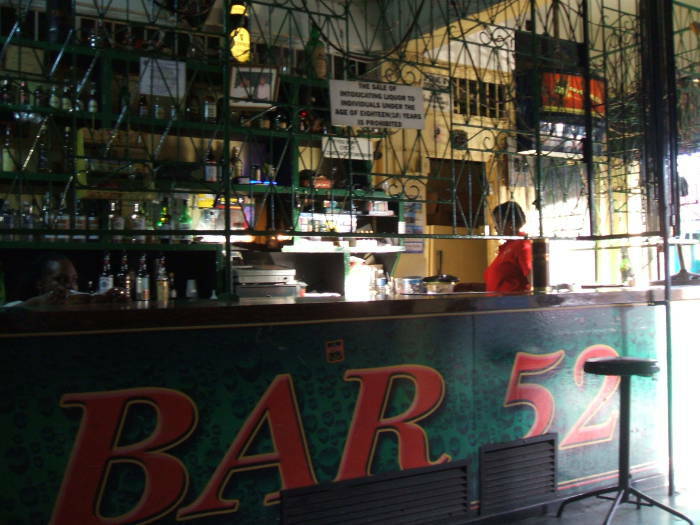 And finally, below, some pictures from Bar 52, also in the western part of town.